To kick this module off, let's do what we did with our previous module and add a page, but now there's a couple things that have changed since the initial videos where we used the development snapshot that come into play when adding this page. First of all, the whole idea of hook menu has been removed. So, we don't have hook menu in Drupal 8. The idea of hook menu in Drupal 7 was that it actually did two things. First of all, it defined a route or the path that you would go to in order to produce certain output, and then it also defined where you would see a link to that page. So, for example, would it display in a tab on another page? Would it display in the admin section? That was part of hook menu as well. 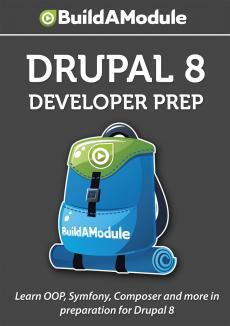 In Drupal 8 this has been split into two separate parts. One is going to be found in the routing. yml file, and that's where we define the actual path that returns the content or output that we're looking for. And the other is going to be found in menu_links. yml, and that's where a module defines where exactly links to that page will display. So, we don't actually need hook menu any more.